New living solutions and innovative research in furniture design will drastically affect design methodologies and will introduce new paradigms: algorithmic modeling, virtual reality, and advanced fabrication techniques. 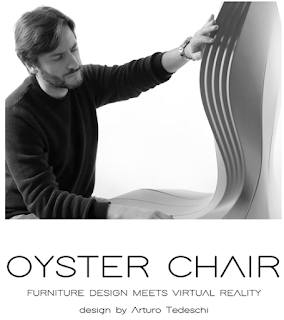 The OYSTER chair is the first prototype designed using virtual reality techniques and manufactured through a 3D milling machine, remotely controlled. OYSTER anticipates future scenarios of smart working and features synergy between Arturo Tedeschi's expertise in generative modeling using Rhino and the implementation of Mindesk's Virtual Reality CAD interface. OYSTER will be introduced at the Fuorisalone Mobile 2018 - Space&Interiors, from April 17 through 21.